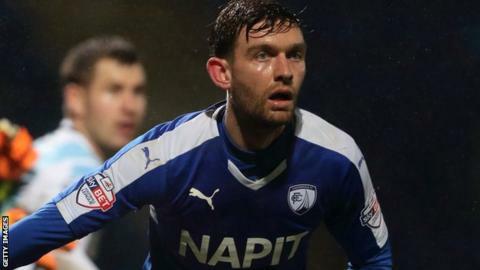 Chesterfield boosted their hopes of staying up with a comeback win to dent Port Vale's slender play-off hopes. Vale took a deserved lead when AJ Leitch-Smith converted Byron Moore's cross. Jamal Campbell-Ryce equalised just after half-time with a drilled finish and Sam Hird headed the hosts in front. JJ Hooper's curling shot brought the visitors level, but Gboly Ariyibi turned in a corner and O'Shea's 20-yard shot sealed the win. The win moved the Spireites up to 17th, five points clear of the relegation zone, while Port Vale dropped to 13th, 10 points adrift of the play-off places. Match ends, Chesterfield 4, Port Vale 2. Second Half ends, Chesterfield 4, Port Vale 2. Substitution, Chesterfield. Jake Orrell replaces Jamal Campbell-Ryce. Goal! Chesterfield 4, Port Vale 2. Jay O'Shea (Chesterfield) right footed shot from outside the box to the bottom left corner. Assisted by Gboly Ariyibi. Attempt saved. Lee Novak (Chesterfield) right footed shot from the left side of the box is saved in the top right corner. Drew Talbot (Chesterfield) wins a free kick on the left wing. Corner, Chesterfield. Conceded by Ben Purkiss. Substitution, Port Vale. Matthew Kennedy replaces Byron Moore. Goal! Chesterfield 3, Port Vale 2. Gboly Ariyibi (Chesterfield) right footed shot from very close range to the bottom right corner. Corner, Chesterfield. Conceded by Louis Dodds. Attempt blocked. Jamal Campbell-Ryce (Chesterfield) right footed shot from the right side of the box is blocked. Goal! Chesterfield 2, Port Vale 2. JJ Hooper (Port Vale) right footed shot from the left side of the box to the top right corner. Assisted by Louis Dodds. Ben Purkiss (Port Vale) is shown the yellow card for a bad foul. Attempt missed. Oliver Banks (Chesterfield) right footed shot from outside the box is high and wide to the right. Carl Dickinson (Port Vale) hits the bar with a left footed shot from long range on the left. Goal! Chesterfield 2, Port Vale 1. Sam Hird (Chesterfield) header from very close range to the top left corner. Assisted by Jay O'Shea with a cross. Attempt missed. Lee Novak (Chesterfield) header from the left side of the six yard box misses to the left. Jamal Campbell-Ryce (Chesterfield) wins a free kick in the defensive half. Corner, Port Vale. Conceded by Drew Talbot. Attempt missed. Jamal Campbell-Ryce (Chesterfield) right footed shot from long range on the right is high and wide to the left. Attempt missed. Charlie Raglan (Chesterfield) header from very close range is close, but misses to the right.